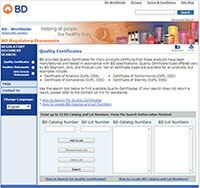 Instructions on looking up the concentration of test-size human reagents by searching the BD Regulatory Documents website are provided below. Once on the BD Regulatory Documents Search page, input catalog number and lot number in the corresponding fields, click Search. Catalog and lot number information can be found on the product vial. To search for multiple certificates, input catalog and lot numbers in their respective fields, then click Add to List. Repeat. Once all product information has been added, click Search. In the search results, click View Certificate. This will open the certificate in PDF format in a separate window. 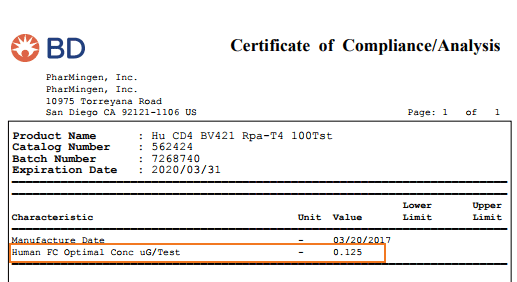 The concentration of the substance will be listed in ug/test in the document.